The Holy Roman Emperor (historically Romanorum Imperator "Emperor of the Romans") was the ruler of the Holy Roman Empire. The title was held in conjunction with the rule of the Kingdom of Germany. From an autocracy in Carolingian times the title evolved into an elected monarchy chosen by the prince-electors. The Holy Roman Emperor was widely perceived to be the deputy of Jesus Christ on Earth by Roman Catholic rulers in Europe, and he often contradicted or rivaled the Pope, most notably during the Investiture controversy. 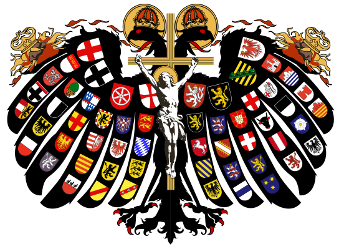 In theory, the Holy Roman Emperor was primus inter pares (first among equals) among other Catholic monarchs. In practice, a Holy Roman Emperor was only as strong as his army and alliances made him. After the Reformation, many of the subject states in Germany turned Protestant while the Emperor continued to be a Roman Catholic. Until the Reformation, the Emperor elect (imperator electus) was required to be crowned by the Pope before assuming the imperial title. Various royal houses of Europe, at different times, became hereditary holders of the title. In particular the Habsburgs kept the longest possession of the title. The Holy Roman Empire was dissolved by Francis II, Holy Roman Emperor as a result of the collapse of the polity during the Napoleonic wars. From the time of Constantine I (4th century) the Roman emperors had, with very few exceptions, taken on a role as promoters and defenders of Christianity. The title of Emperor became defunct in Western Europe after the deposition of Romulus Augustulus in AD 476, although the rulers of the "barbarian kingdoms" continued to recognize the Eastern Emperor at least nominally well into the 6th century; both the title and connection between Emperor and Church continued in the Eastern Roman Empire until 1453, when it fell to the forces of the Ottoman Empire. In the west, the title of Emperor (Imperator) was revived in 800, which also renewed ideas of imperial–papal cooperation. As the power of the papacy grew during the Middle Ages, popes and emperors came into conflict over church administration. The best-known and most bitter conflict was that known as the Investiture Controversy, fought during the 11th century between Henry IV and Pope Gregory VII. After Charlemagne was crowned Emperor of the Romans (Imperator Romanorum) by Pope Leo III, his successors maintained the title until the death of Berengar I of Italy in 924. No pope appointed an emperor again until the coronation of Otto the Great in 962. Under Otto and his successors, much of the former Carolingian kingdom of Eastern Francia fell within the boundaries of the Holy Roman Empire. The various German princes elected one of their peers as King of the Germans, after which he would be crowned as emperor by the Pope. After Charles V's coronation, all succeeding emperors were called elected Emperor due to the lack of papal coronation, but for all practical purposes they were simply called emperors. The term "sacrum" (i.e. "holy") in connection with the medieval Roman Empire was first used in 1157 under Frederick I Barbarossa. Charles V was the last Holy Roman Emperor to be crowned by the Pope (1530). The final Holy Roman Emperor-elect, Francis II, abdicated in 1806 during the Napoleonic Wars that saw the Empire's final dissolution. The standard designation of the Holy Roman Emperor was "August Emperor of the Romans" (Romanorum Imperator Augustus). When Charlemagne was crowned in 800, he was styled as "most serene Augustus, crowned by God, great and pacific emperor, governing the Roman Empire," thus constituting the elements of "Holy" and "Roman" in the imperial title. The word Holy had never been used as part of that title in official documents. The word Roman was a reflection of the principle of translatio imperii (or in this case restauratio imperii) that regarded the (Germanic) Holy Roman Emperors as the inheritors of the title of Emperor of the Western Roman Empire, despite the continued existence of the Eastern Roman Empire. In German-language historiography, the term Römisch-deutscher Kaiser ("Roman-German emperor") is used to distinguish the title from that of Roman Emperor on one hand, and that of German Emperor (Deutscher Kaiser) on the other. The English term "Holy Roman Emperor" is a modern shorthand for "emperor of the Holy Roman Empire" not corresponding to the historical style or title. Successions to the kingship were controlled by a variety of complicated factors. 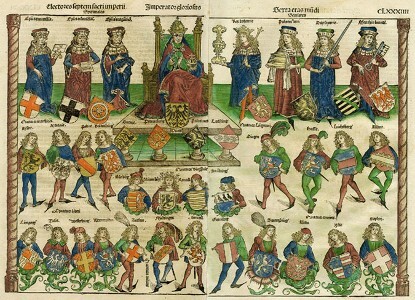 Elections meant the kingship of Germany was only partially hereditary, unlike the kingship of France, although sovereignty frequently remained in a dynasty until there were no more male successors. Some scholars suggest that the task of the elections was really to solve conflicts only when the dynastic rule was unclear, yet the process meant that the prime candidate had to make concessions, by which the voters were kept on side, which were known as Wahlkapitulationen (election capitulations). 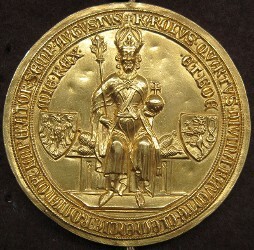 The Electoral council was set at seven princes (three archbishops and four secular princes) by the Golden Bull of 1356. It remained so until 1648, when the settlement of the Thirty Years' War required the addition of a new elector to maintain the precarious balance between Protestant and Catholic factions in the Empire. Another elector was added in 1690, and the whole college was reshuffled in 1803, a mere three years before the dissolution of the Empire. After 1438, the Kings remained in the house of Habsburg and Habsburg-Lorraine, with the brief exception of Charles VII, who was a Wittelsbach. Maximilian I (Emperor 1508–1519) and his successors no longer travelled to Rome to be crowned as Emperor by the Pope. Maximilian therefore named himself Elected Roman Emperor (Erwählter Römischer Kaiser) in 1508 with papal approval. This title was in use by all his uncrowned successors. Of his successors only Charles V, the immediate one, received a papal coronation. 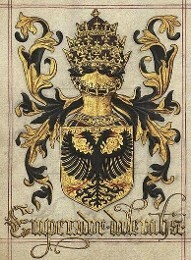 This list includes all 47 emperors of the Holy Roman Empire, whether or not they styled themselves Holy Roman Emperor. There are some gaps in the tally. 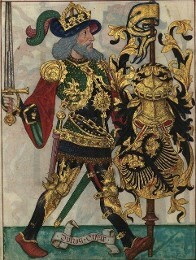 For example, Henry the Fowler was King of Germany but not Emperor; Emperor Henry II was numbered as his successor as German King. The Guideschi follow the numeration for the Duchy of Spoleto. Traditional historiography assumes a continuity between the Carolingian Empire and the Holy Roman Empire, while a modern convention takes the coronation of Otto I in 962 as the starting point of the Holy Roman Empire (although the term Sacrum Imperium Romanum was not in use before the 13th century). There was no emperor in the west between 924 and 962. While earlier Germanic and Italian monarchs had been crowned as western Roman Emperors, the actual Holy Roman Empire is usually considered to have begun with the crowning of the Saxon king Otto I. It was officially an elective position, though at times it ran in families, notably the four generations of the Salian dynasty in the 11th century. From the end of the Salian dynasty through the middle 15th century, the Emperors drew from many different German dynasties, and it was rare for the throne to pass from father to son. 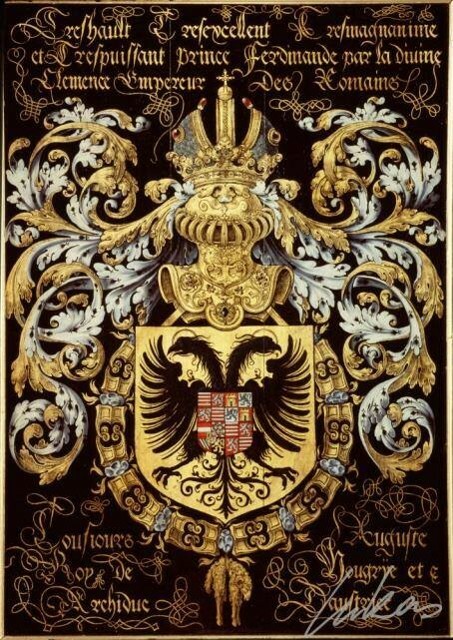 That changed with the ascension of the Austrian House of Habsburg, as an unbroken line of Habsburgs would hold the Imperial throne until the 18th century, later a cadet branch known as the House of Habsburg-Lorraine would likewise pass it from father to son until the abolition of the Empire in 1806. Notably, the Habsburgs also dispensed with the requirement that emperors be crowned by the pope before exercising their office. Starting with Ferdinand I, all successive Emperors forwent the traditional coronation. The Emperor was crowned in a special ceremony, traditionally performed by the Pope in Rome. Without that coronation, no king, despite exercising all powers, could call himself Emperor. In 1508, Pope Julius II allowed Maximilian I to use the title of Emperor without coronation in Rome, though the title was qualified as Electus Romanorum Imperator ("elected Emperor of the Romans"). 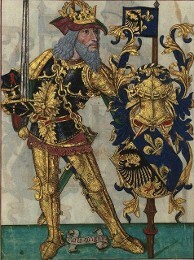 Maximilian's successors adopted the same titulature, usually when they became the sole ruler of the Holy Roman Empire. Maximilian's first successor Charles V was the last to be crowned Emperor. Copyright Held 1963-2019 - All Rights Reserved Protected by European, U.S. and International Copyright Laws.